Caramelized Strawberries with Cream is an English cuisine but the recipe below has an Indian twist. Strawberries and Cream – doesn’t it sound like a heavenly combination? Ahhhh… it this dessert tasted the same and I love it more when my daughter finished a full glass of Caramelized Strawberries with Cream. 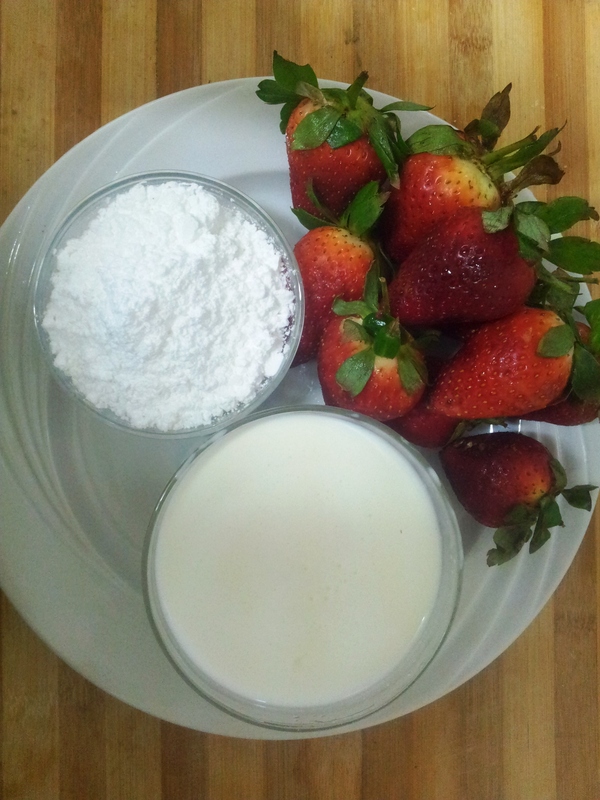 Here is how I to make the Caramelized Strawberry with Cream Recipe. 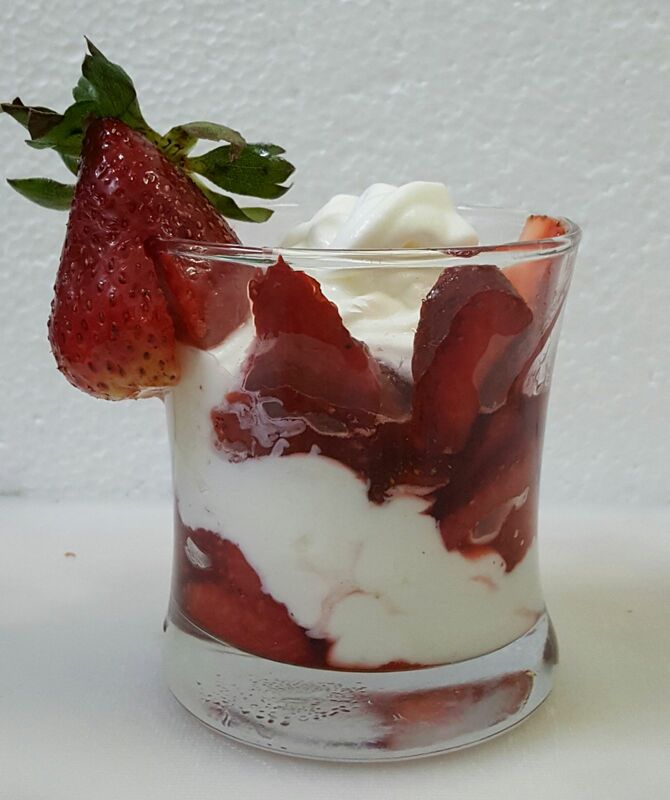 I’d caramelized the strawberries first with the help of castor sugar and then arranged in a serving glass along with whipped cream. It’s like an achievement to trying out something new… and Yayyy .. I did it. It turned out really beautiful and delicious. Well.. for a variety in colour combinations you can go ahead and try out the Caramelised Strawberries with Cream recipe with other fruits. I’ll certainly like to know and see the pics… drop in the comments if you try this dessert with other fruits or if you want a suggestion. This dessert contains less ingredient and takes less time to get ready. To give it an Indian twist I have added fruit chat masala in a very small amount while caramelizing the strawberries. The fruit Chat Masala in the Caramelised Strawberries with Cream gives a mild spicy flavour with sweet sugar and believe me, it tastes amazing when sweet and spicy flavours come together. Beware do not add too much chaat masala it can spoil your dessert. So, let’s go through the recipe so that after having this delicious dessert your heart will say Yumm, Yumm, Yummmy. Servings 2 or depends on the quantity you want to serve. Take the washed strawberries and slice it nicely. Keep two whole strawberries side for decoration; you can eat them later 😉 . Heat a pan for a minute then add sugar, let it melt for a minute. Now add all sliced and whole strawberries, fruit chat masala and mix with sugar until sugar gets into syrup consistency. 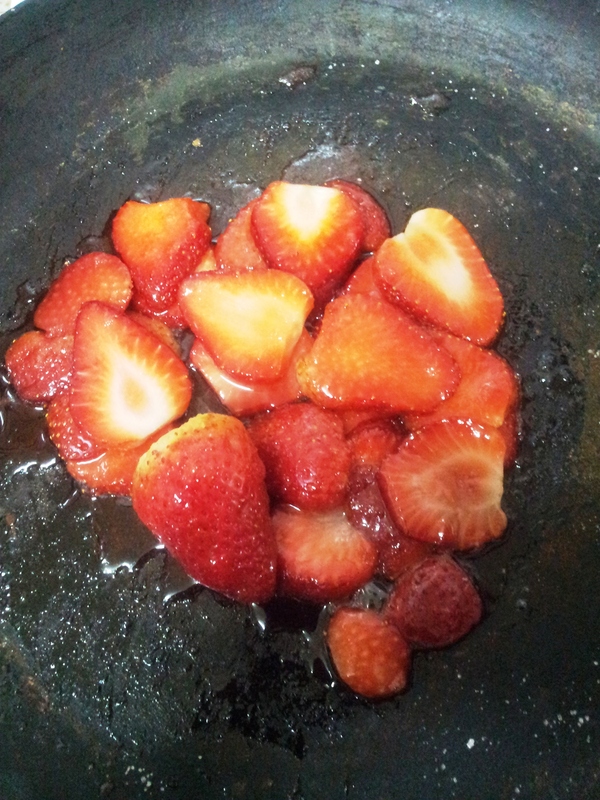 Cook further for few more minutes till sugar becomes thick and properly sticks to the strawberries. Put off the flame and leave it too cool. Your caramelized strawberries are ready. Take the cream in a bowl whip it. While whipping, add two drops of vanilla essence and icing or powdered sugar. Whip the cream until it becomes thick. Now transfer the cream into a plastic cone. Take a glass, arrange strawberries in slanting way. Now with the help of a plastic cone add whipped cream. Again arrange the second layer of strawberries and cream. Decorate the glass with whole strawberry. Your luscious Caramelized Strawberries with Cream with an Indian touch is ready with the given recipe. Tip: Before whipping the cream keep it in freezer for 6-7 minutes for good results. One thing I can’t do: Desserts! Hahaha! But this looks so yummy and so easy to make!!! I have to try this one! I’m sweet-tooth, started my blog with the dessert itself 😀 .. Yes this one is very easy, let me know too when you try the caramelized strawberries with cream. Mouth watering click sara 😋…. lovely! !